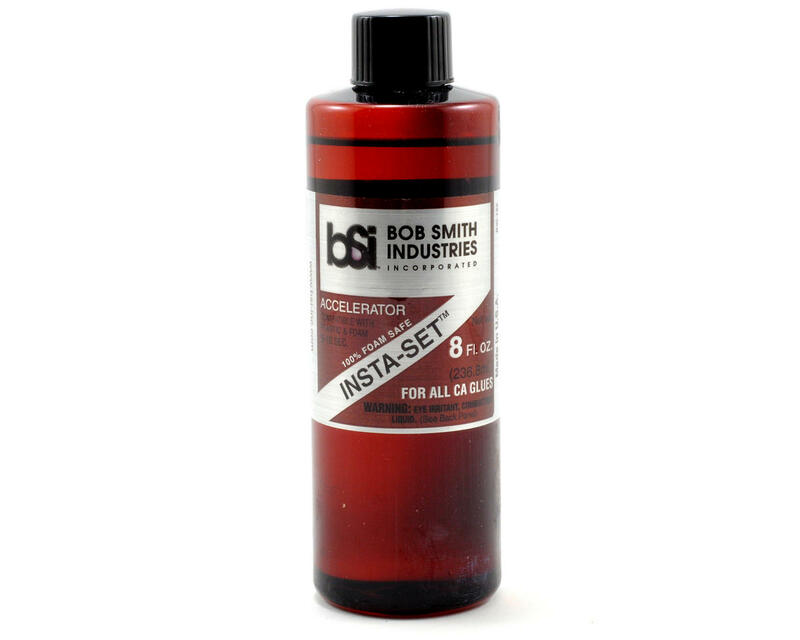 This is a eight fluid ounce refill bottle of Bob Smith Industries INSTA-SET™ Foam Safe CA Accelerator. INSTA-SET™ is a catalyst which acts as an accelerator that allows CAs to quickly cure in thick layers by enhancing the alkaline conditions during polymerization. INSTA-SET™ in a spray bottle is normally used to cure the CA that flows from joints when parts are pressed together. Applying an additional bead of thick CA along a seam and then curing it with INSTA-SET™ significantly enhances a joint’s strength. For difficult to bond materials, INSTA-SET™ can be applied to one surface and CA to the opposite surface. When brought together, they will bond instantly. INSTA-SET™ is formulated with a strawberry scent and activates CA in 6 to 8 seconds without any degrading of the CAs strength, which can occur with many other accelerators. It is compatible with all surfaces, even clear plastic and white foam.